Finland and France went public with information, but Norwegian authorities argue the measurements had no news value. 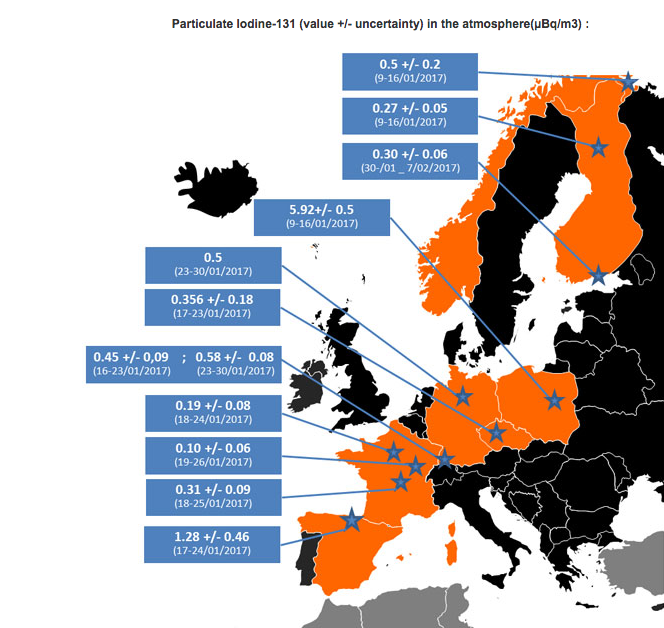 A trace of radioactive Iodine-131 of unknown origin was in January detected over large areas in Europe. Since the isotope has a half-life of only eight days, the detection is a proof of a rather recent release. Where the radioactivity is coming from is still a mystery. The air filter station at Svanhovd was the first to measure small amounts of the radioactive Ionide-131 in the second week of January. The station is located a few hundred metres from Norway’s border to Russia’s Kola Peninsula in the north. Soon, the same Iodine-131 isotope was measured in Rovaniemi in Finnish Lapland. Within the next two weeks, traces of radioactivity, although in tiny amounts, were measured in Poland, Czech Republic, Germany, France and Spain. Norway was the first to measure the radioactivity, but France was the first to inform the public about it. “The preliminary report states it was first found during week 2 of January 2017 in northern Norway,” Institute de Radioprotection et de Süreté Nucléaire (IRSN) writes in a press release. Head of section for emergency preparedness at the Norwegian Radiation Protection Autority, Astrid Liland, says to the Barents Observer the levels measured raise no health concerns. “We do measure small amounts of radioactivity in air from time to time because we have very sensitive measuring equipment. The measurements at Svanhovd in January were very, very low. So were the measurements made in neighbouring countries, like Finland. The levels raise no concern for humans or the environment. Therefore, we believe this had no news value,” Astrid Liland answers when asked why the public was not informed. At Svanhovd, measurements in the period January 9-16 show levels of 0,5 micro Becquerel per cubic meter air (µBq/m3). In France, where authorities decided to publish the information, measured radioactivity were much lower, from 0,1 to 0,31 µBq/m3. Levels measured in Finland were also lower than in northern Norway with 0,27 µBq/m3 measured in Rovaniemi and 0,3 µBq/m3 in Kotka. Finland’s Radiation and Nuclear Safety Authority (STUK) decided to follow the French example and posted a press release about the increased levels of radioactivity. Astrid Liland can’t either explain the origin of the radioactivity. “It was rough weather in the period when the measurements were made, so we can’t trace the release back to a particular location. Measurements from several places in Europe might indicate it comes from Eastern Europe,” Liland explains. “Increased levels of radioactive iodine in air were made in northern-Norway, northern-Finland and Poland in week two, and in other European countries the following two weeks, Astrid Liland says. Iodine-131 in the air could come from an incident with a nuclear reactor. The isotope is also widely used in medicine and for that purpose; many countries around the globe produce it. Map by Institute de Radioprotection et de Süreté Nucléaire. All operators of nuclear reactors or institutions using Iodine-131 for medical purposes have detectors for external releases of radioactivity. Someone out there knows why the radioactivity was spread over larger areas of Europe. Nuclear installations in northeastern Europe, were the radioactivity was first discovered, includes nuclear power plants in Finland, Sweden and Russia, in addition to nuclear powered vessels on Russia’s Kola Peninsula and White Sea area. The source could as well come from even further away installations.